As you continue to load your PlayBook up with awesome games and apps there is yet another that we want to bring to your attention. Now, you may remember the game series that was available on most popular gaming platforms called Tomb Raider. 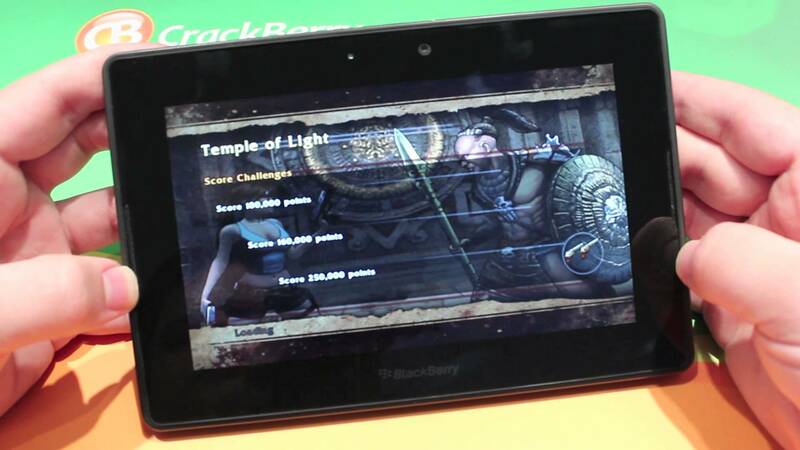 Well a new installment is now available on the BlackBerry PlayBook. Lara Croft and the Guardian of Light is an addictive third person game that contains console quality graphics, a captivating storyline and intense gameplay. Continue reading for the full review of Lara Croft and the Guardian of Light. As you start the game, you quickly realize that this isn’t your average game on a mobile device; it's something much more. You’re introduced to the game with stunning visuals that start to tell a story with a little background information on why Lara Croft has been sent to these Mayan ruins. Your first level is a walk in the park --lay some dynamite, blast the locks, and open the door. As you progress, things become a little more difficult as you are face-to-face with demons from another world. You battle through complex levels using your environment and a few weapons. While a typical shooter game will have your character walking down long corridors pitting you against your enemies, this game adds a little extra depth. Lara Croft and the Guardian of Light will take it one step further and test your skills with puzzles and confusion before you can progress onto other parts of the game. There are quite a few games on the PlayBook that serve up some stunning visuals, like Dead Space by EA, Samurai II: Vengeance, N.O.V.A 2, and now we can add Lara Croft and the Guardian of Light to the growing list. I was really impressed the first time I saw this game demoed at BlackBerry Devcon 2011, and even more so the first time I opened the game and took some time to play it. Square Enix Limited, the developers of this game, have done an amazing job at brining the console style graphics to a portable device. Once you launch the game you’re presented with a visually appealing menu that stays true to the atmosphere of the game. Throughout the game, the developers have placed intermissions and cut-scenes to help tell the story, and the imagery here is just as good as the game itself. Game controls are one of the things that I either love or hate due to the layout decisions of the developer. While the directional controls are intuitive and big enough to control the game with ease, they are small enough that they don’t get in the way of the visual space on the PlayBook. I felt that some of the controls that are used for things like weapon change, jumping, and releasing objects all could have been laid out a little better. 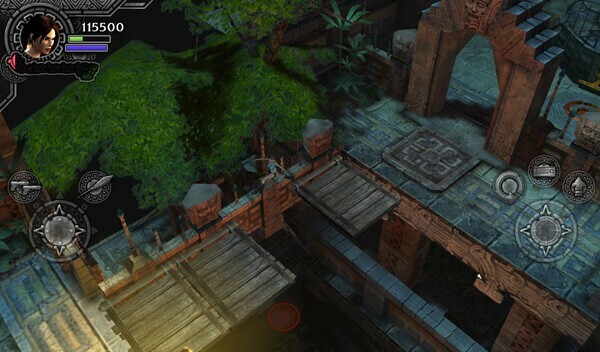 For example, when I needed Lara to jump, I found myself looking down and searching for the jump icon. The icons chosen for the controls were a little confusing at first, making it a bit hard to tell what each button is for. Over the course of the game, I noticed that the controls become more and more intuitive as you get used to the layout and what does what. While most games only contain a few settings and options, Lara Croft and the Guardian of Light has a few extra ones that will help you battle the darkness a little better. From within the settings page you will be able to access options to change the game brightness, sound levels, feedback (in game messages), game control options, language, and the option to reset all data. 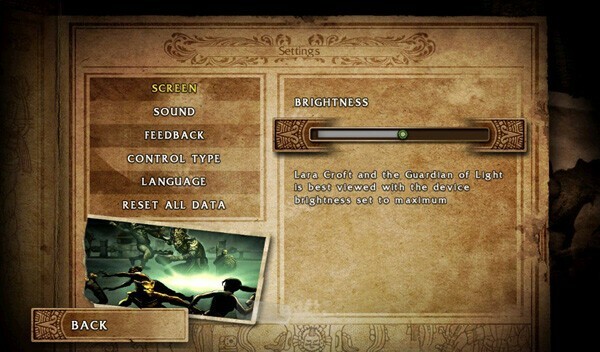 In the settings page, the developers have noted that it’s best to play the game with your PlayBook screen brightness set to full, and then adjust within the game. A good portion of the games on mobile devices don’t offer much replay value, if any actually. When setting out to review Lara Croft and the Guardian of Light I was curious to see if the developer added any achivements or added gameplay other than the core story. 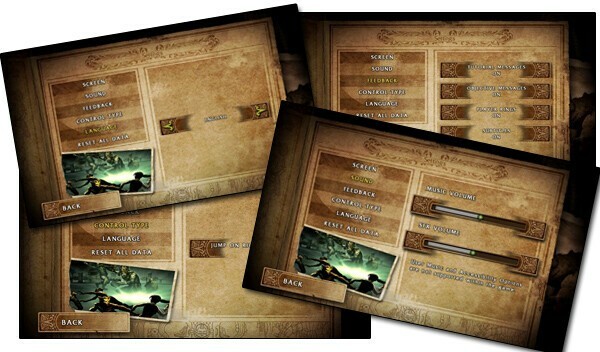 Throughout the game, you will be able to earn achievements to unlock weapons and character upgrades. Achievements might not sound like much, but when you’re comparing yourself to others with the online leader boards I think that mentality might change. For over all replay, I’ll have to say that there isn’t too much, but the game as a whole is well worth the download. 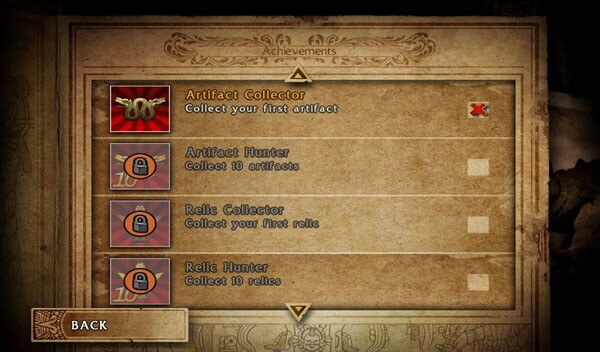 Just think of the in-game achievements more as icing on the cake. There are a few really cool and unique things about Lara Croft and the Guardian of Light. First off the game style; while it's not a first, it's definitely not one you see on a lot of games. Having an overhead, bird's eye view, you are able to see more of your surroundings and actually use the environment to your advantage. Also, the almost console quality graphics and animations are an excellent addition to help immerse you in the game and its story. I found that at the start, using the on-screen game controls was a little confusing. The controls in Lara Croft and the Guardian of Light could have been labeled a little better. Doing so would offer a more instant connection with what button does what. At times, I found that when the game loaded a new area of the map, the orientation of the screen changed causing myself to get disorientated and me to return to the area of the map that Lara came from. 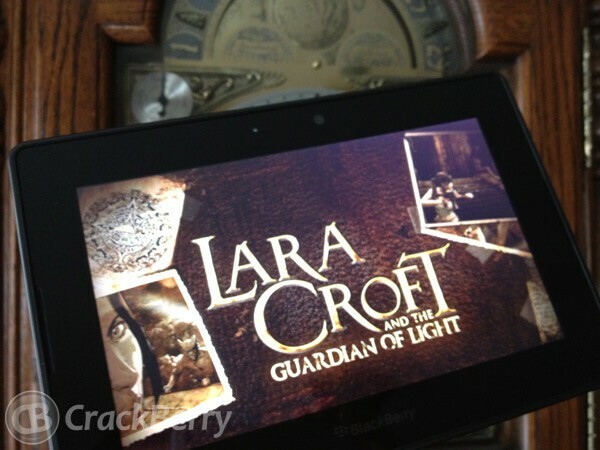 Addictive gameplay, captivating storyline, and intense graphics make Lara Croft and the Guardian of Light an excellent choice for the BlackBerry PlayBook. While there are a few things I found to be annoying, the overall game and gameplay are just too good to pass up. 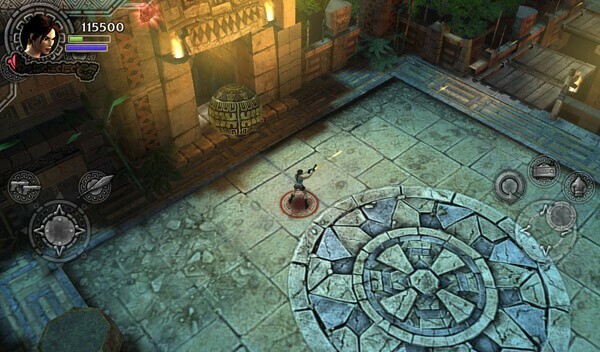 Lara Croft and the Guardian of Light can be found in BlackBerry App World for $3.99.